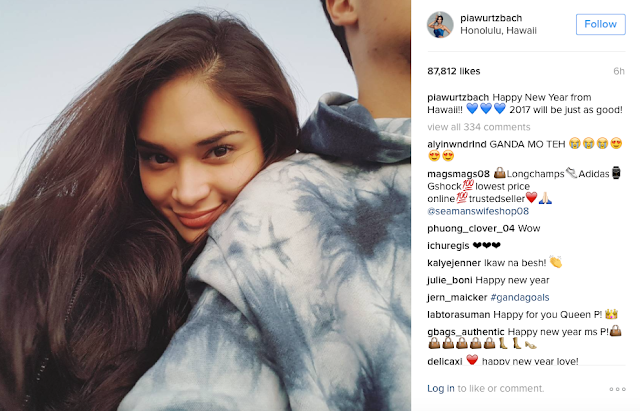 Reigning Miss Universe Pia Wurtzbach and (rumored) boyfriend Marlon Stockinger get cozy and hot while spending the New Year's in Hawaii. There's no confirmation of the relationship from either parties yet. But we Instagram-confirm that PiaLon (Pia and Marlon), is the Philippines' most beautiful couple! With body language and poses not expected from "friends", it was Marlon who posted first a photo of a two-piece clad Pia on his Instagram. He captioned "Beachbumin on the last day of the year." The picture has 28,664 likes as of this writing. Two hours later, she posted a hot photo of her and Marlon, which we assumed is taken at the same beach, with the caption "My Kind of NYE". Marlon was lying on the white sand with Pia clinging at him. Commentors could not hide their appreciation. One netizen posted, "Kinikilig ako sa kanila" while one commented "parang Honeymoon lang...". Has our Miss Universe found her man? What do you think? Here are some photos for more appreciation, all sourced out from their personal Instagram accounts.